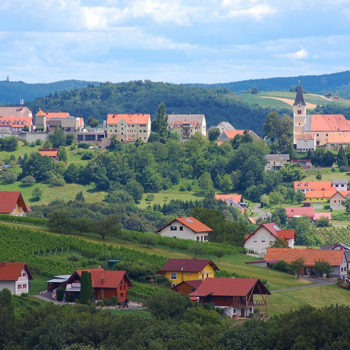 The region Vulkanland, Styria in south eastern Austria is a hidden gem. Not only because of its natural beauty, but also as a paradise for connoisseurs of wine and food lovers. Despite its fiery name the Styrian Volcano Land (Steiriches Vulkanland) doesn’t consist of lava spewing volcanos or blackened scorched earth. 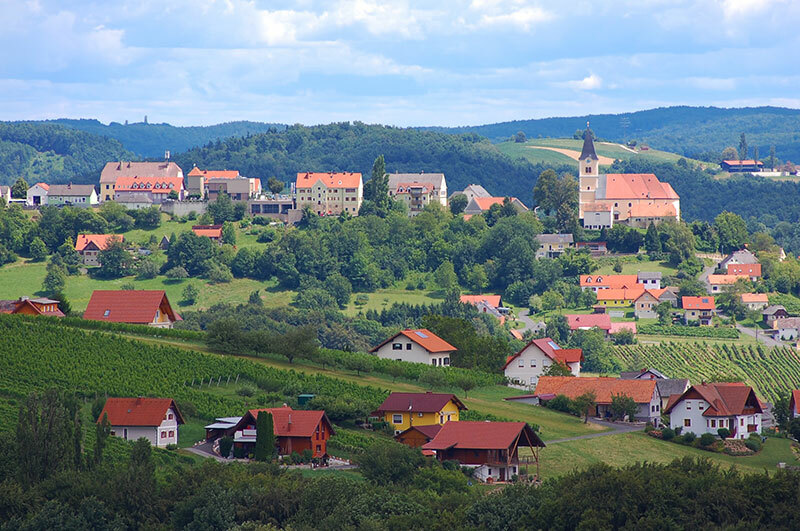 Rather contrary, the region mostly consists of a lush green landscape of rolling hills. 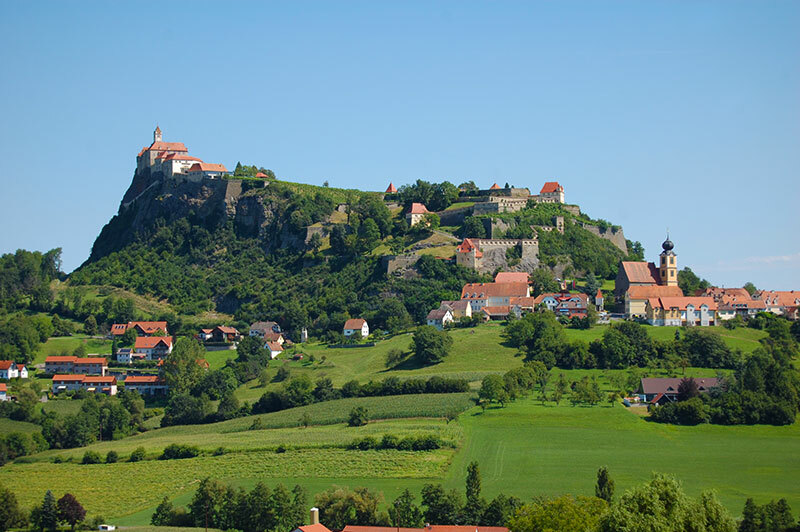 The hillcrests are usually covered by forest and the valleys are dominated by farmland, vineyards and dotted with villages. Sure, the region was a hotspot for volcanoes – 17 million years ago. Since then nature has done its course and created a wonderful green landscape. Moreover, this is a truly lovely vacation region, where you find ample opportunities for hiking, biking or more mellow activities. We have travelled extensively throughout the region for a couple of years. We have experienced everything from museums, wander routes, biking trails, lush nature, fantastic views and of course the culinary delights, which the region is known now for. 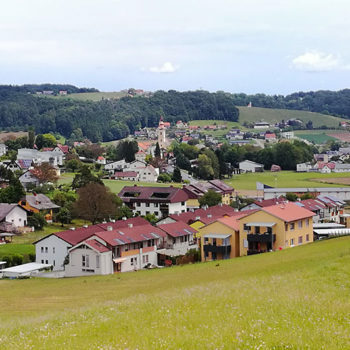 Visiting the Styrian Volcano Land is all about taking it slow and enjoying life. The mild climate, often influenced by the Mediterranean rather than the Atlantic makes this perfect for growing many kinds of fruits and vegetables. 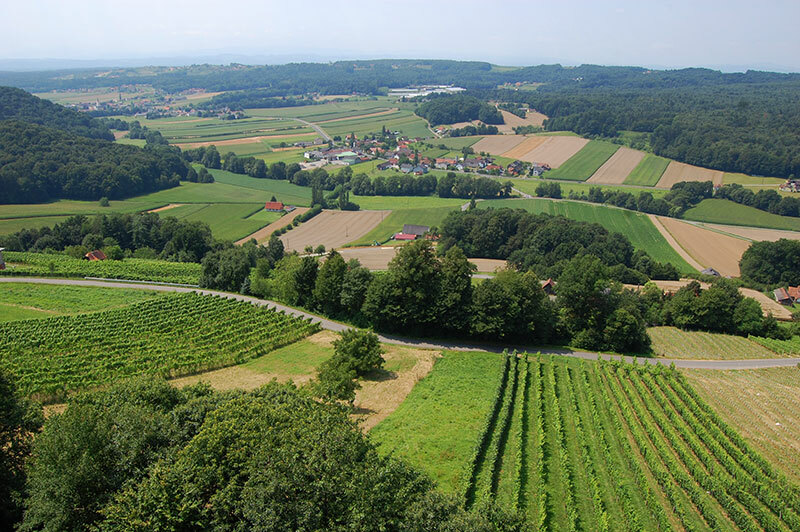 Styria is known as the «Green Heart of Austria», and this part lives up to the promise. Locally produce such as apples, cherries and strawberries are readily available in local stores and supermarkets, as soon as they are in season. Don’t forget to pick up a bottle or three of Kurbiskernöl (Pumpkin seed oil). The green cooking oil can be used on everything from ice-cream to soups and salads. Local eateries are keen promoters of local produce and often serve dishes based on short travelled food. Although the region offers a huge variety of activities, tourism in Volcano Land is still low key compared to for example Tyrol or Salzburg. 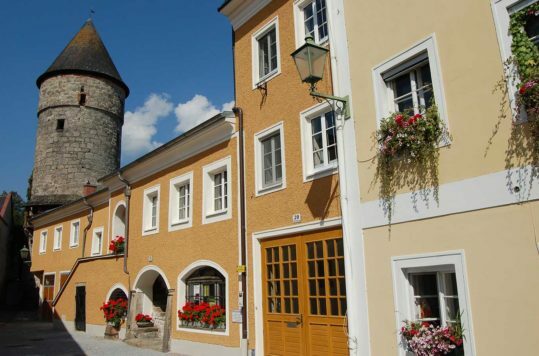 Despite the lack of alpine mountain peaks and cable cars the region offers a multitude of leisure activities, especially for wander and bicycling enthusiasts. 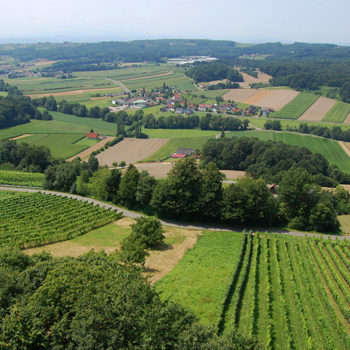 The region, awash with wander and bicycling routes, leading you through vineyards, farmlands and woodlands. 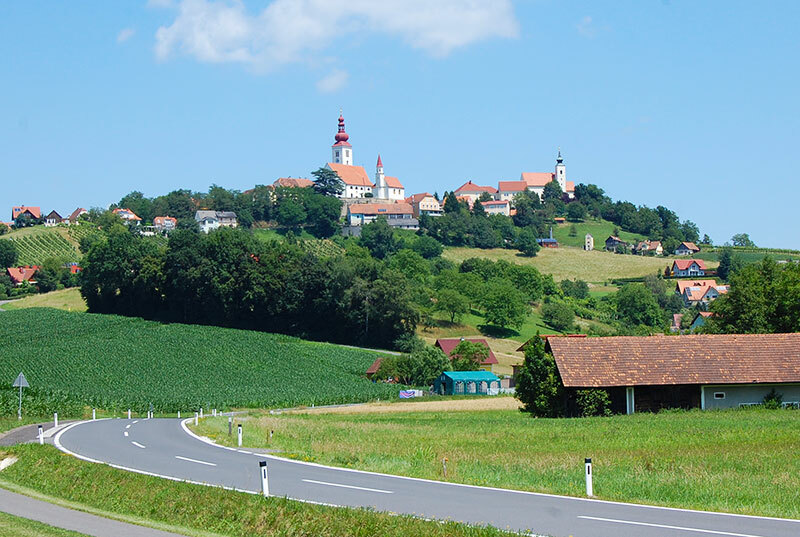 Many of the well signed routes have special viewpoints, such as hilltop villages, chapels or viewing towers, which offer spectacular views of the region. 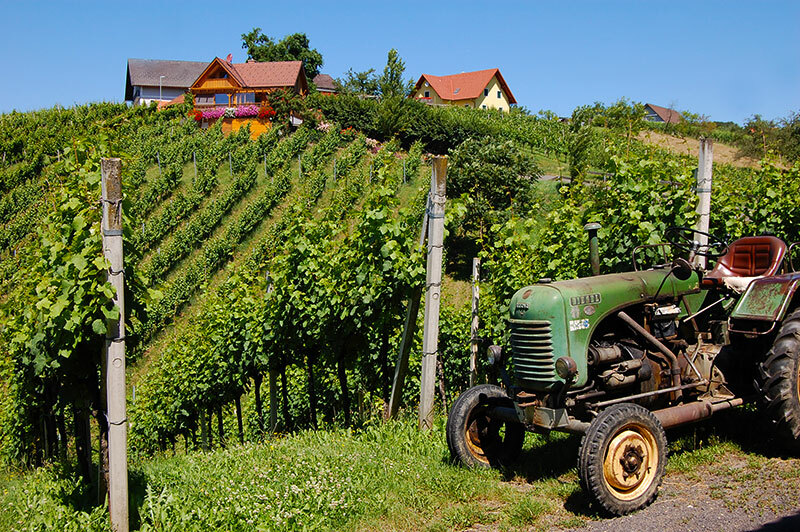 South eastern Styria has over the last couple of decades gained a reputation for producing quality wines. Moreover, the regions vineyards have spurred culinary tourism and combined with local produce, you are never far from great eateries that serve local food and wine. At first sight, the nature is not anywhere as spectacular as the high Alps. However, don’t be fooled as the landscape is not at all boring. The Volcano Land will still leave you climbing up and rolling down steep winding roads. Another great feature of the region are the short distances. You could easily stay in one place and explore the region by foot, bike or car without wasting too much on transport. We can’t list absolutely all places you should see. Nonetheless, here are our favourites and we leave it up to you to find yours. 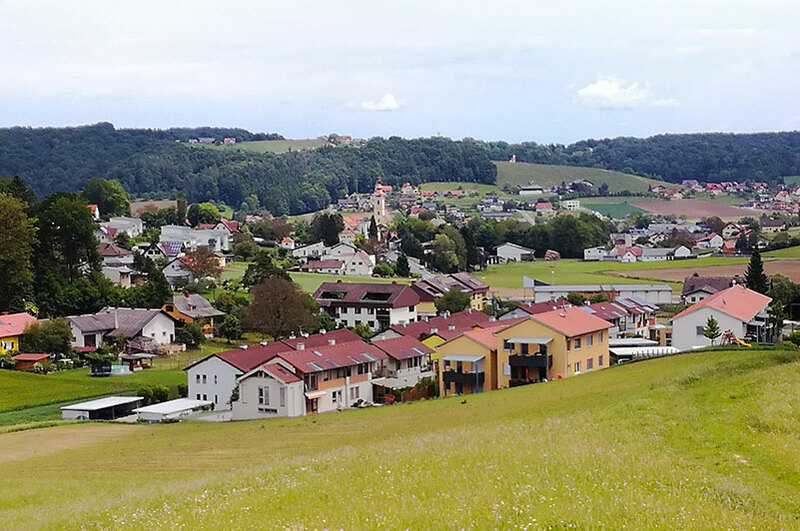 A tiny hilltop village easily visible from afar due to its three church towers. 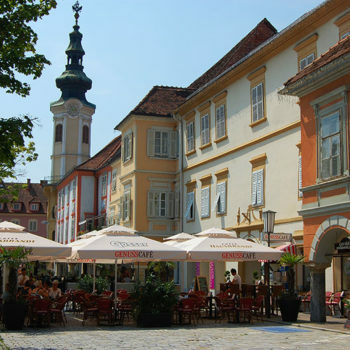 It has a lovely little plaza where you can enjoy a nice lunch or delicious Austrian pastry. 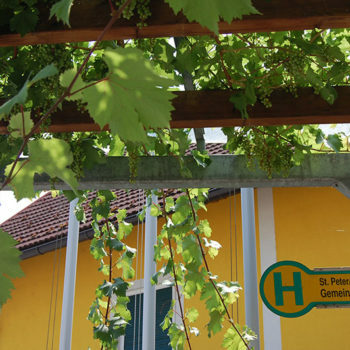 One-street hilltop village strung out along a narrow hillcrest, in the middle of vineyards. 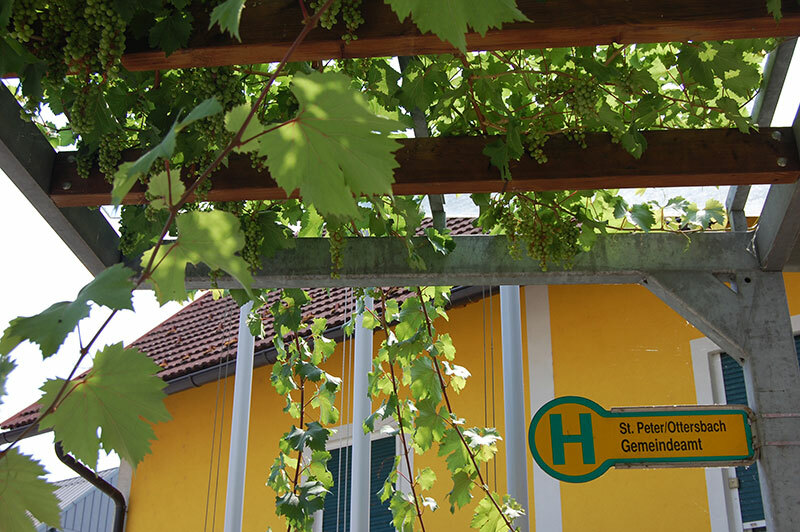 The Vinothek is a must visit to sample local wines. Climb the 25 metres high wooden viewing tower and enjoy fantastic views of large parts of the Styrian Volcano Land, and even into Slovenia. The village is primarely known for its fantastic Rosegarden (park). It also has a small but fun waterpark with nearby mobile home parking. Furthermore, the valley and hills offer great hiking. Famous cliff top castle, that also comes with an idyllic hamlet below. It also hosts a great museum. 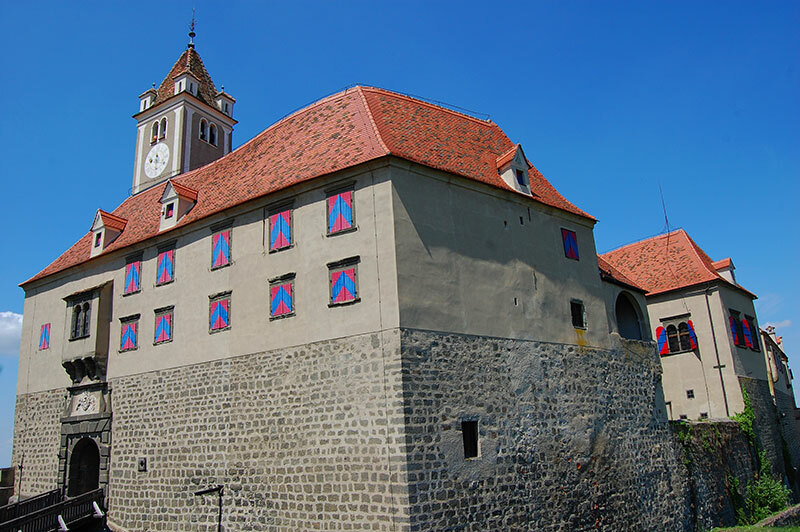 Read the entire article about the Riegersburg Castle! 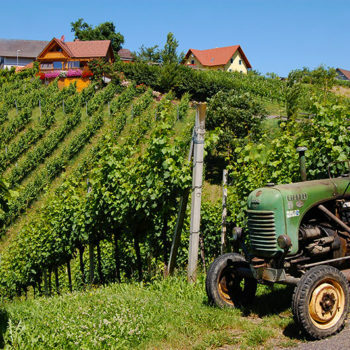 The hillside vineyards, just a few kilometres west of the Slovenian border, produce high quality wines such as the Traiminer. Stay on the hill in small guesthouses with splendid views, wander among the vineyards or simply have a romantic picnic. 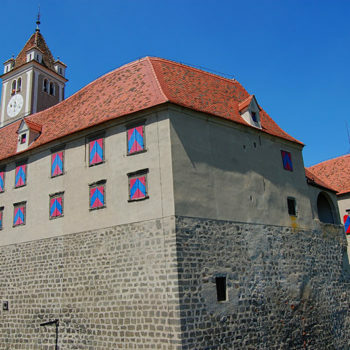 Mur forms part of the border between Austria and Slovenia. 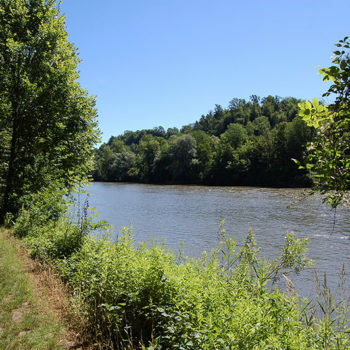 Along its banks you find almost jungle-like hiking trails. 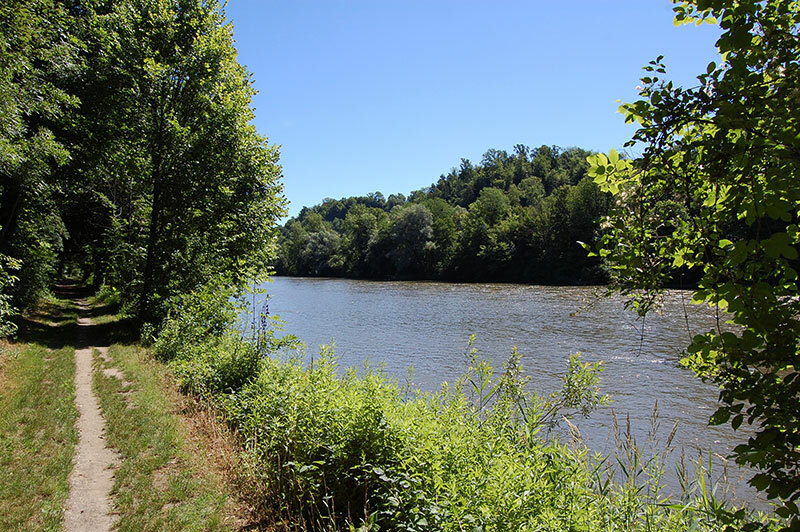 On a hot summer day, hike or bike along the river, and enjoy a delicious fish platter at a riverside restaurant. Finally, it’s not a place but a railway trip which we highly recommend. 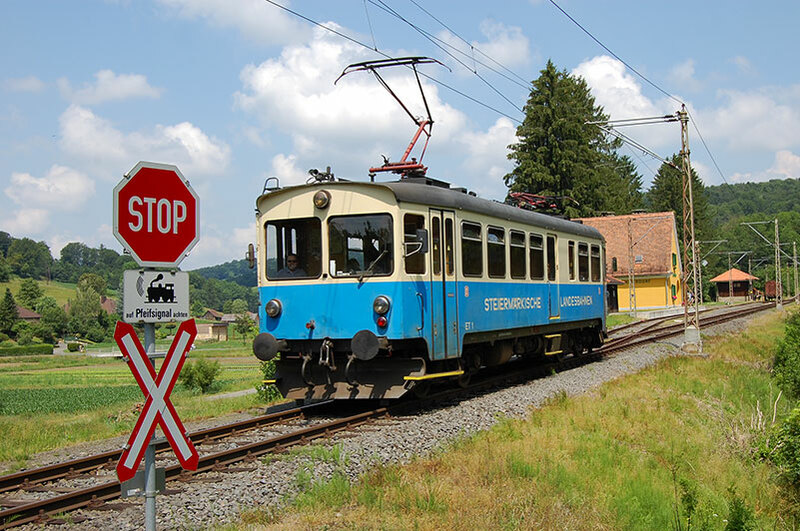 A local train which winds its way slowly the 22 kilometres between Feldbach and Bad Gleichenberg. 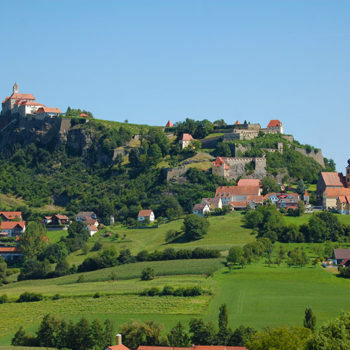 The trip will give you great glimpses of the landscape in the Styrian Volcano Land. You can jump on and off the train and use some of the many hiking trails adjacent to the track. 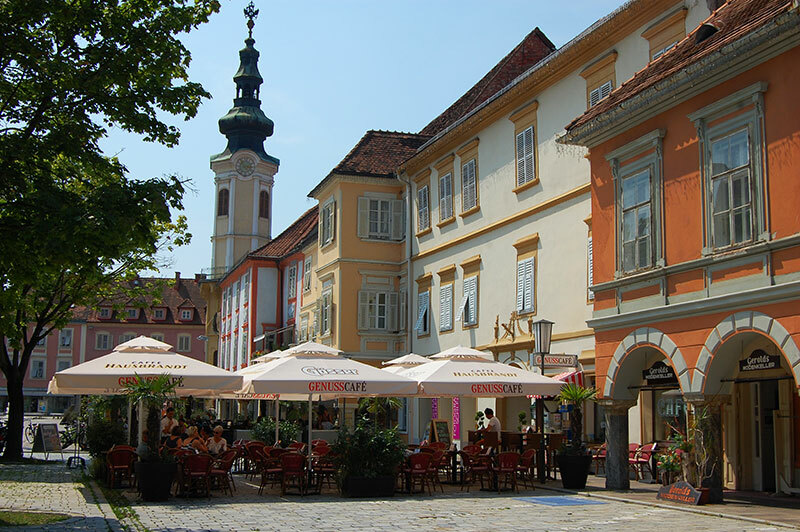 Styria’s capitol Graz is the nearest city, and has an international airport only about 40 minutes to one hour twenty away. 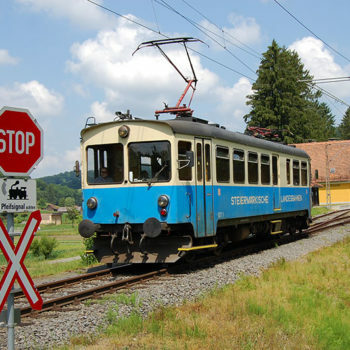 Moreover, Graz is also on the railway line between Slovenia and Croatia. Vienna is only about two hours away by car or railway.